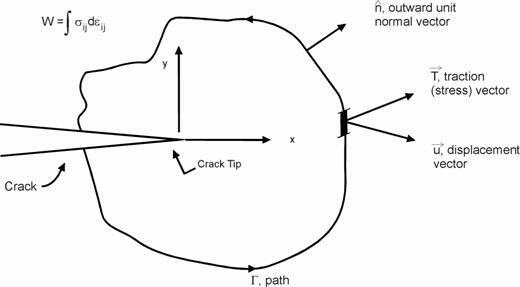 where G is any contour surrounding the crack tip, traversing in a counter clockwise direction (see Figure 2.2.13), W is the strain energy density, is the traction on G, and is the displacement on an element along arc s.
Before elaborating on a detailed description of the parameters involved in the calculation of the J-Integral, it is useful to note that Equation 2.2.33 is the nonlinear elastic equivalent of Equation 2.2.12. Thus, for linear elastic materials, J reduces to the value of the strain energy release rate, G, i.e. where E¢ is given by Equation 2.2.18. Equations 2.2.35 and 2.2.36 are noted to be valid only when the material is behaving in a linear elastic fashion. When values of the J-Integral are determined via Equation 2.2.34 using finite element methods applied to linear elastic cracked structures, Equation 2.2.36 provides the engineer with a simple energy-based method for obtaining stress-intensity factors as a function of crack length. In the first subsection below, the calculations associated with developing the J-Integral for an elastic-plastic material are detailed. In the second subsection, some engineering approximation methods for calculating the J-Integral are outlined.